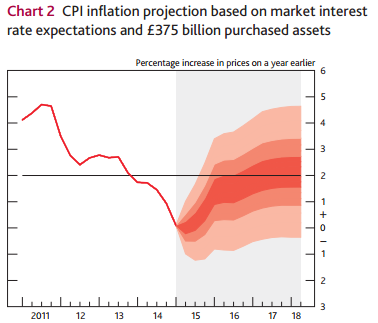 First day back after two weeks early summer sunshine in Salento (the heel of Italy) and I have spent the afternoon watching the BoE MPC press conference on playback and reading the May Inflation Report. And while watching events from afar last week left me a little worried that the risks were tipping to a later (than I) expected first rate hike, I’m not sure that the MPC’s views has really changed all that much over the past 3 months. In particular, the short sterling moves that followed the very out-of-step Haldane speech (my thoughts here), were proven to be absurd, with Gov Carney clearly giving short shrift to the idea of cutting rates. I found the most interesting thing to come out of the press conference was Carney’s description of the neutral rate (he referred to it as equilibrium rate, which is technically wrong, but I will give him the benefit of the doubt given a journalist audience). He went into some detail about the importance of where policy rates where relative to the neutral rate during the crisis, today and over the coming years. In particular, he noted several times that the headwinds that had pushed the neutral rate negative in the crisis were diminishing (indeed, he went further than I expected in saying that the banking system was virtually healed) and would continue to do so. As such, he saw neutral rates rising steadily over the forecast, and as such, policy rate (which he described as currently below the neutral rate) rising too. This narrative chimes remarkably well with my thoughts on the US (here), and is something that I very much agree with in the context of the UK too. What was also interesting was that Carney wanted to make the point alongside their view that slack was currently estimated to be around 0.5%, and given the above-trend growth expected over the coming year, would be around zero by early 2016. 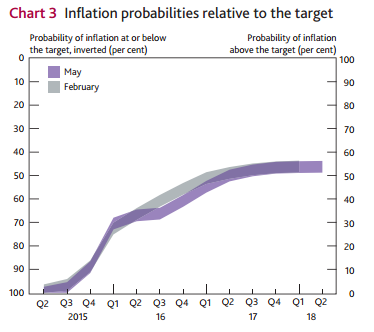 The inflation forecast was almost identical to the one presented in February, despite a slightly higher conditioning path for rates and the sterling effective exchange rate around 2% higher (both of which would mechanically push down on the inflation forecast by a few tenths). It is also despite a somewhat slower near-term growth forecast, as potential supply growth has been revised down by a similar amount. All of which said to me that they remain on track to hike at a gradual pace, starting in the not too distant future (traditionally the BoE would hike before slack had been completely eroded due to the lags in monetary policy). My view has been for some time that could mean as soon as November this year. I still think that is a possibility, and while the risks are skewed to February, the market continues to price almost no chance of it happening this year. 1) The fiscal assumptions will be updated in August based on the new governments “emergency” July Budget. The government have said they will be sticking to their manifesto plans, which had significant spending and benefit cuts, but also a bunch of un-costed spending promises. My guess is it will net out to be not too different to the current fiscal envelope, but there is a risk of somewhat greater fiscal tightening in the near-term (and hence a risk to the timing of first rate hike). 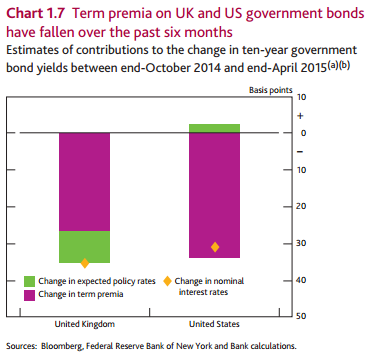 2) Carney said the Committee was pretty sanguine about the recent rise in govt bond yields. The puzzle was why they had fallen by so much over the past year. I happen to agree with this completely, but I really don’t remember the BoE saying that this was a puzzle at the time. One for me to go back and check. 4) As Carney said a number of times, the biggest downside risk to the central view is that actual productivity and wage growth do not rise as expected, with less upward pressure on inflation. Once again the wage data will be one of the key metrics for timing of first rate hike.